This Spring we explore the playful and exciting story of Coppelia. We will strive to increase focus, improve your child’s ballet vocabulary, and improve upon proper execution of ballet fundamentals. Nurturing your child’s creativity, joy, love of movement are daily class goals made possible in a focused and caring environment. A great class for children who require a more high-energy approach to movement classes. Both Creative Ballet and Pre Ballet introduce ballet fundamentals and French terminology, but Creative Ballet is a great class option for children who require a more high-energy, playful and creative approach to learning movement. We will also work on social skills such as taking turns, following directions, dancing with a partner, as well as musicality, creativity, and self-expression through movement. This joy-filled class will help increase focus, motor skills, strength, balance and flexibility. We will also explore story ballets, and learn a piece of choreography to represent the story we are studying. This is an independent class for students who are ready to remain in the studio for the full 45 minutes without a parent or guardian. Please check your receipt for necessary ballet attire. Both Creative Ballet and Pre Ballet introduce ballet fundamentals and French terminology, but Pre Ballet is best suited for children who thrive in a more focused and structured setting. We will work on social skills such as taking turns, following directions, dancing with a partner, as well as musicality, creativity, and self-expression through movement. This joy-filled class will help increase focus, motor skills, strength, balance and flexibility. We will also explore story ballets, and learn a piece of choreography to represent the story we are studying. Ballet 1 is best suited for children who have spent at least one session with Katarina at the NECC. 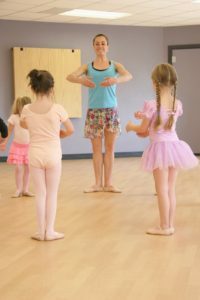 Ballet 1 is best suited for children who have spent at least one session with Katarina at NECC. We will not spend much time reviewing the things learned in pre-ballet or creative ballet as this class builds on the fundamentals learned in prior classes. Ballet 1 requires more discipline, focus and body awareness than Pre Ballet and Creative Ballet classes. We continue the work of nurturing self-expression through movement, creativity and increasing our French vocabulary and terminology. Ballet barre work will be introduced in this class to start learning correct ballet posture and form as well as building memorization skills. These joy filled classes will help increase focus, motor skills, strength, musicality, balance and flexibility. We will also explore story ballets, and learn a piece of choreography to represent the story we are studying. Ballet 1 & 2 is best suited for returning and new students to ballet. The class reviews fundamentals learned in Pre Ballet and Creative Ballet while building increased discipline, focus and body awareness. We continue nurturing self-expression through movement, creativity and increasing our French vocabulary and terminology. Ballet barre work will be introduced, and students begin learning correct ballet posture and form and building memorization skills. This joy-filled class will help increase focus, motor skills, strength, musicality, balance and flexibility. We will also explore story ballets, and learn a piece of choreography to represent the story we are studying. Please check your receipt for necessary ballet attire. Ballet 2 is best suited for students that have had at least two sessions in Ballet 1 or Ballet 1 & 2. We will continue building on these prior classes and on our French vocabulary and terminology. Increased student focus, memorization skills and body awareness are needed to enjoy the more challenging choreography and curriculum presented in this class. We continue the journey of nurturing self-expression through movement and creativity. Each class includes ballet barre as we strive to improve ballet posture and form. This joy-filled class will help increase focus, motor skills, strength, musicality, balance and flexibility. We will also explore story ballets, and learn a piece of choreography to represent the story we are studying. We offer Adult Ballet Classes! See our current offerings here.